I'm a mother, wife, teacher and writer, based in Lancaster, England. I've been writing longer than I can recall, but I do remember sitting in lessons during high school (apologies to my music teacher), furiously scribbling my first book by hand on a pad of paper. It was a mystery story, set in the modern day, about mistaken identities. It was awful, but I still have that story as a reminder of when I started to get 'serious' about writing. I firmly believe that, if you work hard enough and care enough, you can overcome any odds and achieve your dreams. Trinity by Claire Davidson is a powerfully written tale that begins with Kiana, the reincarnation of the goddess Miale. All her life, Kiana has been isolated from the public, and has been confined to Blackoak Castle. On the day she is introduced to her newest Guardian Protector Nidan, the castle is besieged by the Wolves. This is a clan of ferocious bearded humans, whose goal is to avenge the death of their god Ysia by killing the embodiment of Miale. Armed with mages that are able to draw power out of the earth as well as their own kind, they are able to unleash deadly magical fire that destroys the castle and all of its inhabitants, except for Kiana and Nidan. 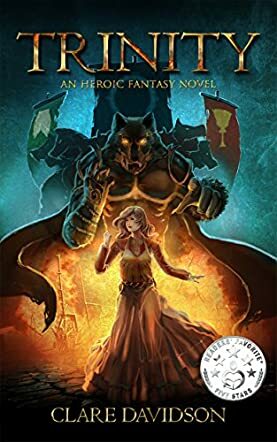 They flee towards a safe village, until they meet up with Skaric - the Wolf that was responsible for the most destruction. Because of his conscience, he was later branded a traitor and a coward, and nearly killed by the jealous war leader Barend before escaping. The Alpha wants Skaric brought back alive, but Barend has other plans, in addition to the death of Kiana. Claire Davidson takes this newly formed alliance of three characters that are representatives of the three gods; Miale, Pios and Ysia. As they began traveling together, it reminded me of a similar group from J.R.R. Tolkien's The Lord of the Rings. The trio of Frodo the chosen, Sam his protector, and Gollum, the torn enemy that helps them. As the plot develops, Claire interweaves a love story while our trio has to come to terms with themselves and their pursuers, as well as their struggle to stay alive. With Barend chasing them to the ends of the earth with the ferocity of a terminator, a desperate plan just might be enough for their Trinity to survive.